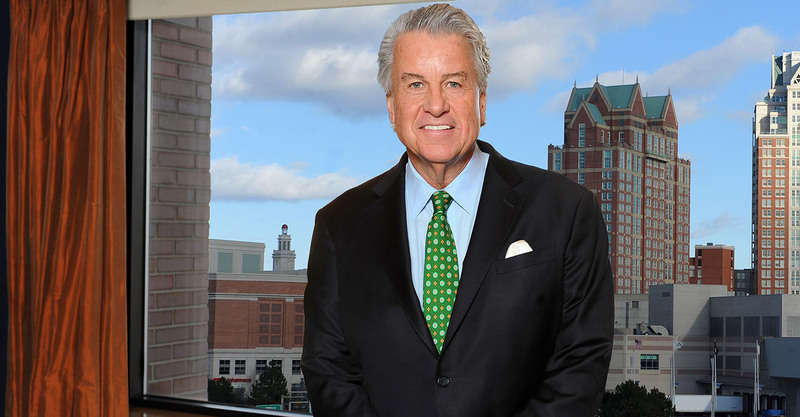 A trial lawyer in his 38th year, Pat Jones practices primarily in Massachusetts and Rhode Island. Raised in Cleveland, he came to New England for college and law school, and stayed for marriage. “My wife of 44 years said yes to marriage but no to the Midwest on a take it or leave it basis. Tough negotiator. It turned out well for us,” Jones says. In the past decade, Jones of Jones Kelleher has been president of both the Massachusetts Academy of Trial Attorneys (MATA) and the Rhode Island Association for Justice (RIAJ), the only attorney in both groups’ history to have led both groups as president. Lawdragon: Can you describe the path that led you to your longtime focus on trial work for the injured? Pat Jones: Sure. I was incredibly fortunate to be trained on the insurance defense side by two legends of the Boston trial bar, Tom Burns and Earle Cooley. I learned the defense side of tort law first, but by the late ’80s I had switched sides. I wanted to be a voice for those who had suffered injustice and harm. No question my defense background made me a better victims’ lawyer. Allowed me to always see things clearly from the other side. LD: And how did you end up in Rhode Island? PJ: Long story that’s been told before. Set of circumstances led to my taking the bar exam there in ’02 at 51. The Station Nightclub in West Warwick burned down two months after I was sworn in. I was able to add some fire litigation expertise to a great group of trial lawyers down there, made some great friends over the eight years we worked on the fire case. Ended up being allowed to lead the state trial lawyers for a year, and to serve on the board of the state’s only law school, Roger Williams. Working in Rhode Island has been one of the highlights of my professional career. LD: Your resume includes a lot of non-legal board service. How do you manage that? PJ: I think most board work comes down to a willingness to lead and to advocate for a worthy cause, and that’s a good fit for a trial lawyer. Right now my most meaningful service is on the Board of Directors for Pine Street Inn, New England’s largest resource for homeless men and women. My service and board work there aligns with what I try to do every day as a trial lawyer, help individuals and families who have suffered tremendous loss. Pine Street’s ultimate goal is to move homeless individuals – many of whom struggle with mental illness, addiction, circumstances beyond their control – from temporary shelter to permanent housing. I have a personal connection to these issues, and I’m proud to be a part of this effort. LD: Share a few things that you find satisfying about the practice today. PJ: First and foremost, the great firm atmosphere I work in today. Most of my partners have been with me since the day they finished law school. Many of our support staff have been with us 15-plus years. There’s a collegial and respectful atmosphere here that sustains our firm through both good and challenging times. Healthy doses of humor and irony help us get through the occasional bouts of hysteria. And I really enjoy mentoring high school and college kids thinking about law school and this practice. I think lawyers who like what they do have an obligation to model their satisfaction and success to those who are questioning whether the profession, in this legal economy, is for them. Young people need to see the whole picture – that lawyers work hard, have fun, have a voice on social issues in their community, give back, and can play a broader role than the one typically imagined. LD: Quick advice for lawyers just starting out in their careers? PJ: Never forget civility. Take good care of yourself physically and mentally. Improve your listening skills. Build relationships with your adversaries. Laugh.